Winter in Vermont is picture postcard perfect. You’ve seen the Clydesdale ad, with the horse drawn sleigh gliding over fresh sparkling snow. That popular clip was filmed at Vermont’s Sugarbush. The setting of rolling snow-covered mountains, the backdrop to church steeples and quaint New England towns, is only one reason to go. The real story lies in the long snow season, you can ski for six months here at Killington and carve Vermont’s highest peak at Stowe. There are 18 ski areas to choose from in the Green Mountain state. 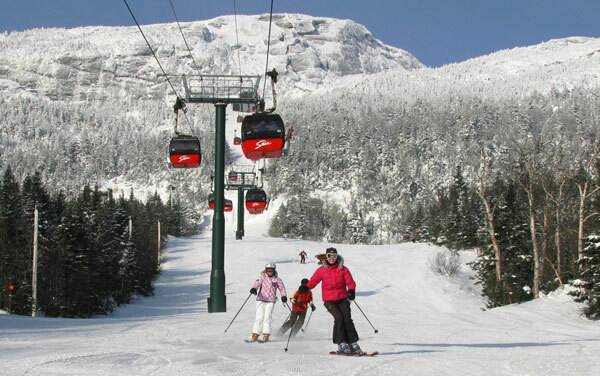 Vermont’s ski areas are diverse, you will find sophisticated resorts with the latest in lifts and snowmaking like Okemo and Stratton, a private ski resort at The Hermitage Club, and classic ski mountains like Sugarbush and Smugglers Notch with time honored trail skiing or adventurous glade terrain at Jay Peak, and several friendly smaller ski hills such as Burke Mountain, Suicide Six and Bolton Valley. There are even old school ski gems like Magic Mountain, and Mad River Glen – one of the last three ski areas that does not allow snowboarding. Vermont is a great choice for a family ski vacation. The scenery is beautiful, the folks are friendly and The Green Mountains are perfectly white in winter.